Bean and Yolk, a play on the term Coffee and Eggs is a brunch spot by Papo Jorolan that has found its way to Alabang. With roots in Poblacion, they are best known for their sandwiches and coffee. The new Alabang branch features a much larger space and an expanded menu. The new menu includes salads, waffles, and desserts. Larcy♥s Cupcakery Cafe in BF! As we were driving along Aguirre Street in BF Homes, Paranaque City, we couldn’t help but notice the Larcy’s Cupcakery Cafe that opened this holiday season. Ever since Sonja’s Cupcakes opened in Sept. 2006, most of the bakers that specialized on cupcakes are either home-based or bazaristas, and no one has a full-blown bakery, and cafe with an all-day breakfast. “Who is Larcy?”, I asked myself because I was impressed that she has opened with a wholistic-brand approach and focused on niche-marketing – the “Cupcakery Cafe” concept. I met Chef Bruce Ricketts, nicknamed “Broosy”, when he was doing his specials for the night in the @ChefBroosy Food Truck at Cucina Andare. He had worked for various famous restaurants in California, and has finally decided to go home to join the vibrant dining scene here as one of the youngest chefs in Manila. For an early 20’s guy who had worked in California and who comes from the family of famous actor (and tito) Ronnie Ricketts, he was surprisingly down- to- earth and very passionate about making a difference right now in Manila. After his short stint in Robot, and contemplating to have a molecular gastronomy restaurant in Makati, he decided to set up his resto in the BF neighborhood and go for what most Filipinos love – Japanese food. Sensei Sushi is not designed to be cuisine-based and does not pretend to be authentic. The food is based on what is freshly available in the local markets and what they can concoct in-house. The menu is written on the blackboard so that they can change it every 2 to 3 days. RAMEN YUSHOKEN: Guide to the BEST Ramen in the South! The Vivere Skyline view never cease to amaze me. When it first opened, we immediately fell in love with this place. This is a must place to visit when you are in the Filinvest area. The infinity pool and the banahaw touches give a boracay feel to the entire 31st rooftop bar and restaurant. I want to jump into the pool overlooking Laguna de bay. This is the look of the room where we stayed last night. We just hosted our regional teammates two weeks ago for a teambuilding experience that they will never forget. Last September, I already treated my team to a City Kart racing session and that is why we know that it would be a memorable event. We decided to do it again for 42 people coming from ASEAN, Australasia and India. I personally had fun because the racing format was 90 minutes of non-stop endurance race. We divided the team into 8 groups of 5 and we let them decide their strategy on how to change racers to complete the entire 90mins race. The only requirement is that each team member should race for 6 minutes at a minimum. The team who completed the most laps wins the race! Before the actual endurance race, we conducted a race leveling where we let every one have their test run for 6 minutes. Their lap times will be the basis for creating the group and we want to make sure that each group has a mix of fast and slow racers. After the leveling, the teams chose the main racer who would run the qualifying round to decide the pole positions at the start of the endurance race. It was really fun. I actually got sick after this race because I was drenched with sweat in my suit and I did not change my shirt.. We started at 6pm and ended the race at 11pm. Overall, we spend about P150k for the entire teambuilding session for 42 members of our regional team. After this, it would be difficult to think about the team building for next year since the expectation was to top this one. If you have any bright ideas, let me know. Thanks to Jeff and the City Kart Team!! Here is a glimpse of the endurance race team building we had two weeks ago. City Kart Racing, First Indoor Go Kart in the Philippines! I must admit if not for my readers, I would have miss visiting this place @ Westgate in Filinvest, Alabang. From the outside, you only have a glimpse of the white staircase and there are no visible signs of happy eaters. The name sounds cheesy and childish that you will make you think twice if you want to eat here. The place just opened in June so for the record, it was ahead of the hawaiian resto — Polu Kai in Serendra. 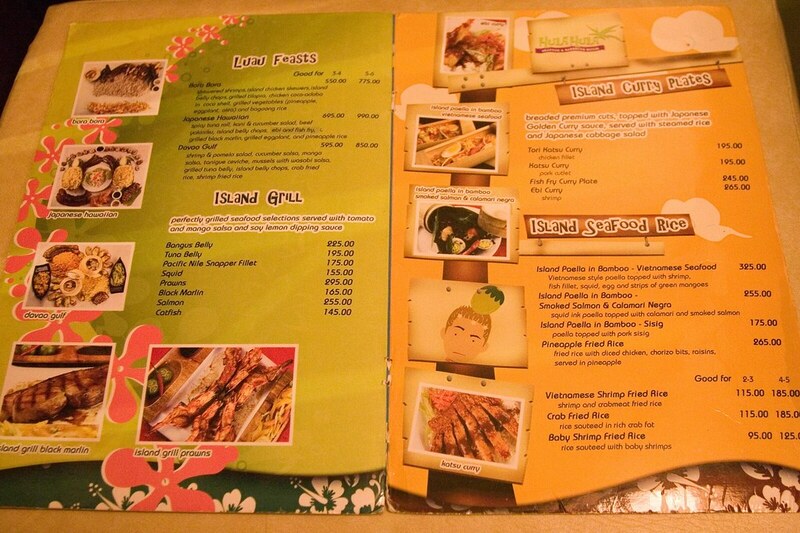 It feels like Gerry’s grill with Japanese, American, Portuguese and Asean cuisine fusion. Is this really how Hawaiian food should look and taste like? Polu Kai actually beats Hula Hula in terms of ambiance, warm welcome and space (*** it feels like it since Hula2 seems to be crowded). But this Hawaiian inspired resto in Westgate, is definitely much more affordable and you won’t complain about the quality of the food. We were tempted to order the Luau feast which is good for 3-4 persons and the price ranges from P550+ for the Bora Bora to P695+ for the Japanese Hawaiian. The Luau feast is quite innovative since they put composition into the arrangement of ordinary food and it appears like food painting from the distance. Since it is only me and my wife, we decided to try the best sellers of the house which includes the Mess of Steaks and the Paella in Bamboo Sticks (this turned out to be more expensive though). Overall, great affordable food that you would come back for more. I usually have a rule that once I’ve eaten in a resto, it is seldom that I go back since I would like to save our resto money for other new places out there. But for Hula Hula, we’ll make an exception since by the looks of the Luau feast, not only is it a good photo opportunity but you can also see the happy faces of the people eating it 🙂 Lastly (huling hirit na), this is a good place to treat your friends or family on your birthday or celebrating milestones like graduation. October 18, 2006 Update: Formerly Voulez Vous which means “Do you want? “, I just recently went back to Westgate and realized that this place has a new permanent name “The French Corner”. Here is my original post on Voulez Vous and I was wondering if only the name was changed or is there also something different with the menu and the chef? Formerly C’est si Bon (which was registered already to a pastry store) , Voulez Vous offers Mediterranean cuisine — I crave for this type of food 🙂 This is manned by Billy King’s proteges Larry Cruz and Chef Mauro Arjona. Billy King’s claim to fame is having worked as the executive chef of Le Souffle which is one of Manila’s Best Fine Dining restaurants. This is located in Westgate Filinvest, Alabang and if you look at the building structure, you won’t be immediately attracted with its weird shape building facade.